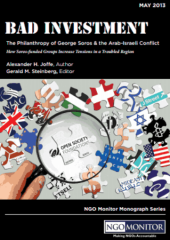 This monograph provides a detailed examination of the philanthropy of George Soros, the activities of the Open Society Foundation network, and their effect in the context of the Arab-Israeli conflict. George Soros, the Soros family, and the Open Society Foundation network are among the world’s largest philanthropists, with major impact on a global scale. This monograph provides a detailed examination of these activities and their effect in the context of the Arab-Israeli conflict. Based on open-source data, including tax-reporting documents from the givers and recipients, this report also analyzes the role of a little-known and rather secretive branch of the Open Society Foundation – the Open Society Institute, based in Zug, Switzerland. The background for this report is the intensive campaign of delegitimization and political warfare targeting Israel, led by influential nongovernmental organizations (NGOs), under the banner of human rights and similar moral objectives. Soros has been a frequent critic of Israeli government policy, and does not consider himself a Zionist, but there is no evidence that he or his family holds any special hostility or opposition to the existence of the state of Israel. This report will show that their support, and that of the Open Society Foundation, has nevertheless gone to organizations with such agendas. Among the objectives of this report is to provide detailed and fully sourced information on these activities, and to inform Soros and others involved in his charitable activities about their impact. The evidence demonstrates that Open Society funding contributes significantly to anti-Israel campaigns in three important respects: 1. Active in the “Durban strategy;” 2. Funding aimed at weakening U.S.support for Israel by shifting public opinion regarding the Israeli-Palestinian conflict and Iran; 3. Funding for Israeli political opposition groups on the fringes of Israeli society, which use the rhetoric of human rights to advocate for marginal political goals. The first category comprises large and extensive Open Society Foundation grants to Palestinian organizations such as Al-Haq, Al-Mezan, and Palestinian Center for Human Rights, as well as Israeli political NGOs, including Yesh Din, Breaking the Silence, and Adalah. These groups are active in promoting the Durban strategy by attempting to portray Israel as a “racist” and “apartheid state” that commits “war crimes.” A primary goal of such demonizing language is to isolate Israel internationally, leading to the implementation of sanctions. Many of these NGO recipients are also leaders in the international boycott, sanctions, and divestment (BDS) and “lawfare” campaigns, including the filing of international lawsuits aimed at harassing Israeli officials. This report also examines contributions from Soros to international NGOs such as Human Rights Watch ($100 million) and Amnesty International, both of which focus disproportionate and biased attention on Israel. The Soros gift to Human Rights Watch came after a series of scandals, including fundraising in Saudi Arabia to promote its anti-Israel campaigns and support for the Ghaddafi family as “human rights reformers.” Concurrently, founder Robert Bernstein publicly renounced Human Rights Watch, and a number of core donors also withdrew their support. In the second category are organizations that aim to shift U.S. public opinion regarding the IsraeliPalestinian conflict. The report examines the role of the Soros family in supporting U.S.-based organizations such as J Street, Media Matters, the Center for American Progress, the National Iranian American Council (NIAC), and the Institute for Middle East Understanding. These groups share the goal of influencing American public opinion and leaders on Middle East policy issues, and reducing domestic support for Israel. NIAC seeks to enhance the public standing of the Iranian regime and shield it from efforts to prevent the illicit acquisition of nuclear weapons. In the third category is funding for Israeli political opposition groups on the fringes of Israeli society. This includes gifts to organizations such as Adalah, B’Tselem, Breaking the Silence, Gisha, and Yesh Din. These organizations promote a narrow, marginal political agenda that is far outside the Israeli consensus, often join in promoting the Durban agenda, and in some cases reject Israel’s existence as a Jewish state. Other grant recipients are large foundations, such as the New Israel Fund, which in turn support many of these same Israeli organizations. The extent of Soros’ and the Soros family’s awareness of the issues raised in this monograph is a matter of speculation. Though smaller grants are authorized by OSF staff, the largescale OSF and Soros family grants to Amnesty International, Human Rights Watch, and the Institute for Middle East Understanding, along with Center for American Progress and Media Matters, are almost certainly known by foundation leadership and the Soros family. In this sense, the grants represent their intentions and are expressions of their values. Yet, to what degree Soros, his family, and the Open Society Foundation are aware of the cumulative impact on Israel and of the political warfare conducted by many of their beneficiaries is an open question. Recommendations: First, George Soros, the Soros family, and the Open Society Foundation network should institute complete transparency, in contrast to the secrecy outlined in this report. Second, they should ensure that beneficiaries act in strict accordance with the universal moral principles, and abstain from promoting totalitarian regimes such as in Iran, as well as from participating in demonization of Israel through the exploitation of the language of human rights.